Langholm sealed second spot in East League 2 and with it promotion, with a runaway win against Gala YM at Milntown on Saturday. In front of a large crowd, Langholm scored nine tries, eight of which were converted, and a penalty goal. Centre Nathan Smith had a personal tally of 39 points. With the pitch in good nick and the weather kind, there was some great running rugby and Langholm showed what they are capable of when in full flow. Unfortunately for YM, they only had 15 players and, despite causing their hosts a lot of difficulty and scoring two tries, they tired in the second half, enabling Langholm to run riot. 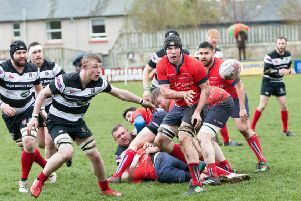 Langholm opened the scoring after eight minutes when a good move by Niall Cubbon resulted in a try by Nick Swanston, who ran round his opponent to the line. Smith slotted the conversion. Langholm continued to pile on the pressure and Alan Tyler burst over for a try after 17 minutes. Smith again landed the conversion and then, a few minutes later, kicked a penalty. Gala YM responded with a penalty kick of their own through Cammy Finlayson to make the score 17-3. Langholm were now playing some very good attacking rugby and created a number of chances before Cubbon took the ball just in side the Gala 22 and broke the tackle and side stepped the full back to score a great try just next to the posts. Five minutes later, Smith who scored the fourth try, securing the bonus point, with 36 minutes played. Langholm temporarily let down their guard and Gala YM, after a good spell in the home 22, scored a try through Shane Kellett, with Cammy Finlayson adding the extras to make the half time score 29-10. Any thoughts YM would make a Twickenham-type comeback were quickly swept aside early in the second half as Langholm’s powerful backs ran in two more converted tries and the match was now out of sight for YM. Scores from Jonathan Wilkes and Smith, who converted both, made it 43-10. YM were tackling their hearts out but the Langholm backing up was brilliant and that was how they were getting their scores. In the middle of the half , YM had another good spell and, from a move in the home 22, quick passing sent Kieran Douglass over for their second try, again converted by Cammy Finlayson. Langholm ran in three further tries, one from captain Alasdair Cavers and two from Smith, who converted all three. Coach Craig Hislop and all the squad of players this season, should be proud of their achievement, and the team was given a great reception in the club rooms. 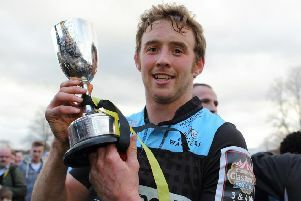 For Gala YM, Shane Kellett was named their man of the match – although it could have gone to anyone, such was the way they tackled the bigger home team and never gave up. YM can now enjoy the sevens circuit, starting at Hawick Linden this weekend.